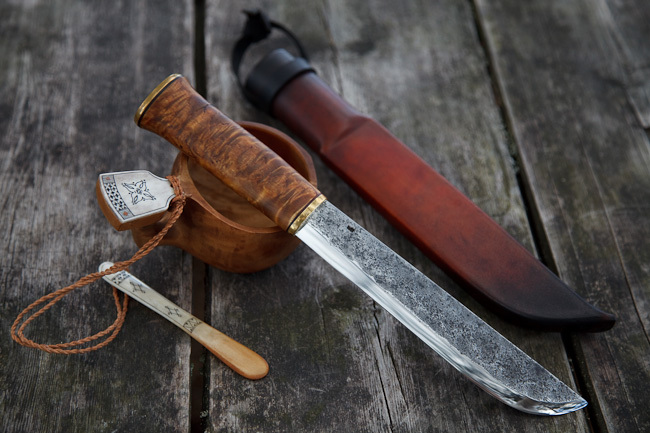 “For most Finnish people the word leuku brings immediately a large Lappish knife to mind. That’s correct, as that is what a leuku is, a large knife originally from northern parts of Scandinavia. 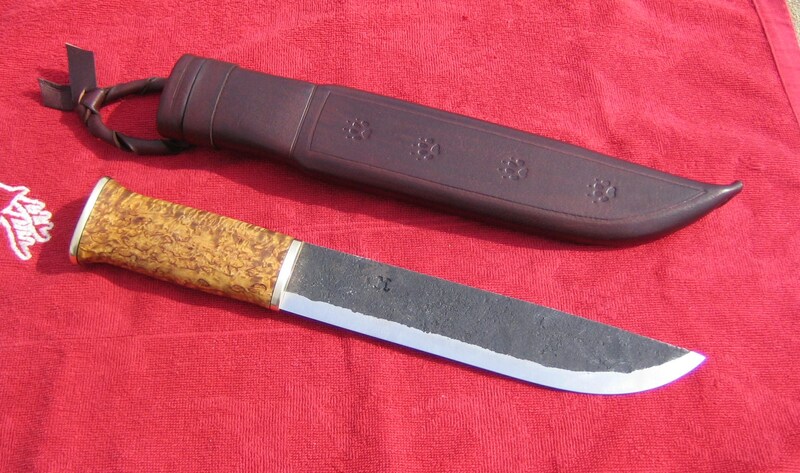 Clear characteristics of a leuku are full pommel, straight handle, relatively high blade which is not really pointed and not tapering lower in height towards the tip. Spine can be straight or bit curved/drop point. Some people are really strict on what is a leuku and what’s not. For me it’s clear, if I see a knife I can tell immediately if it’s a leuku or not in my opinion. There are not any exact standards on that. For example I’ve seen a picture of full-tang leuku made by Pekka Tuominen, and for me that clearly can be called a leuku, even if there’s no historical example found like that. Tradition itself is an on-going thing, it doesn’t stop on some certain age, even leukus and their design can still get some new winds in the design. Without forgetting the tradition of course. Of leukus size and style you can see that it’s clearly meant for hitting. Also it served as a kind of all-rounder, tasks varying from splitting and batoning wood to skinning and gutting animals, all-round camp knife. Saami people also had a smaller knife, “unna niibas”, the size of a common puukko, for smaller tasks like whittling etc. So a leuku clearly hasn’t been a whittler or a carver, which can be seen already by the size of it. 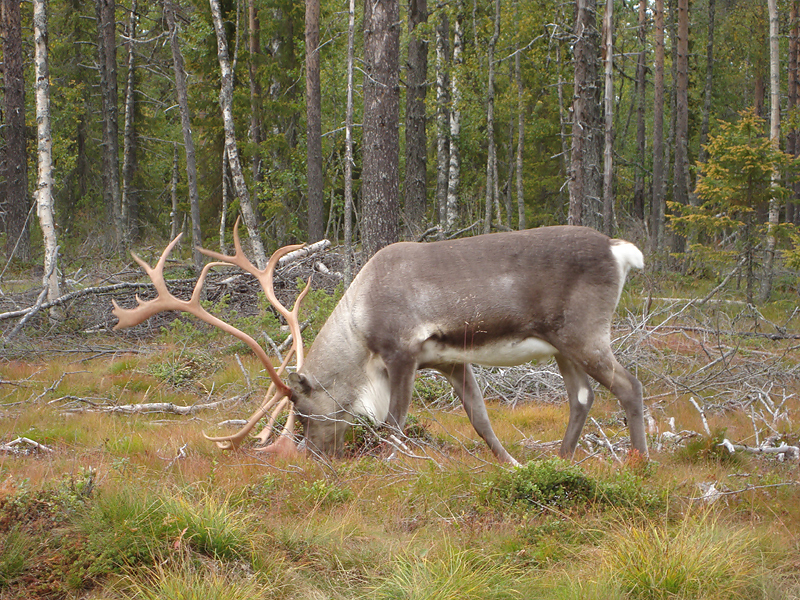 Traditionally materials used on leukus were wood (birch or sallow), reindeer antler/bone and reindeer hide. 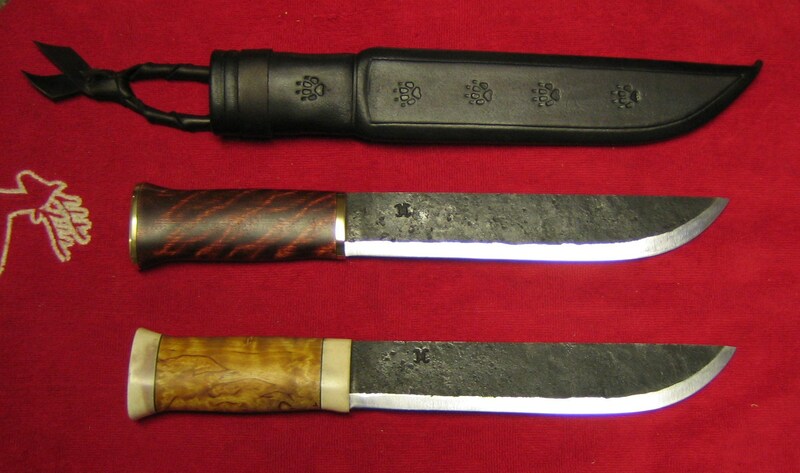 Blades were made out of any suitable carbon steel that could be found. Brass was used on bolsters and rivets if available. 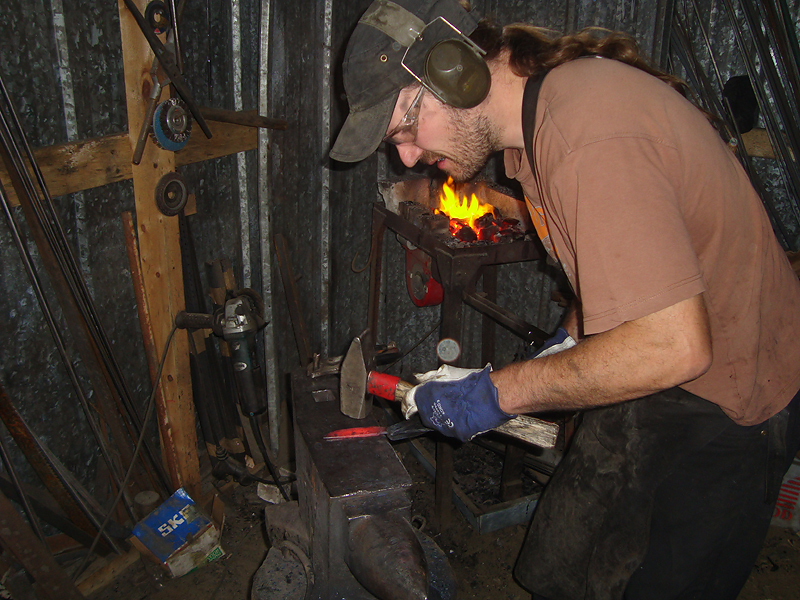 Blade length could vary from 15 up to 24cm. 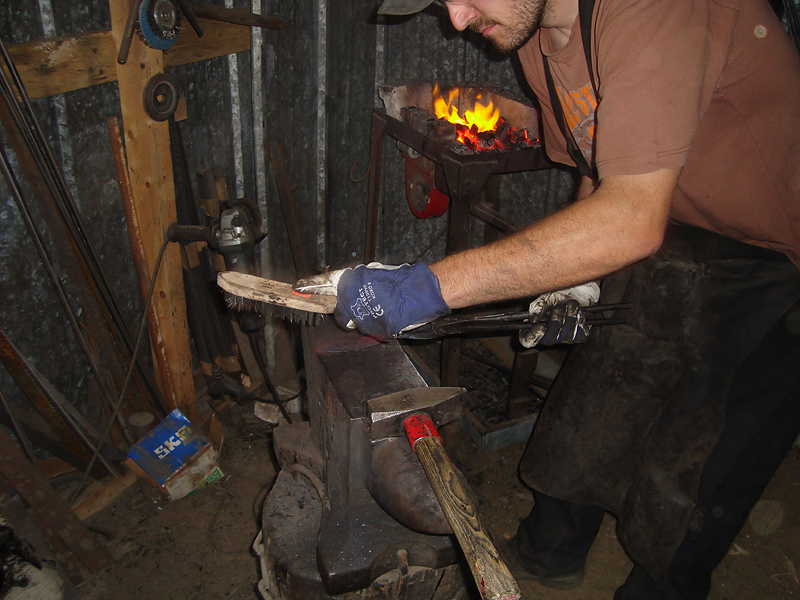 Usually blades have been relatively thin, less than 4 mm. 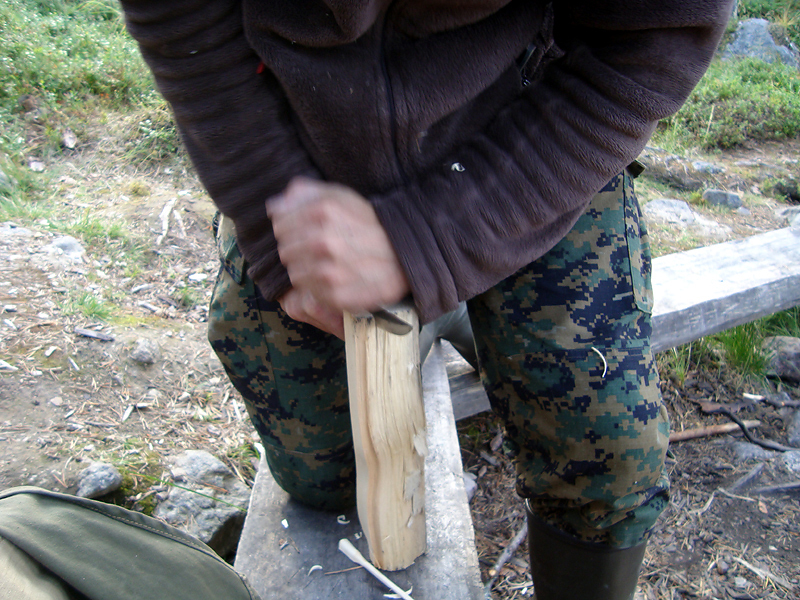 A thin blade was enough for cutting timber of tundra area. Grind types varied too, depending what maker thought was useful. Decorations and amount of them varied among the makers. Some preferred more of them, and some were even specialized in bone carvings. But the same goes with leukus as with all types of knives; there are really decorated collectors items, simple everyman users, and everything between. 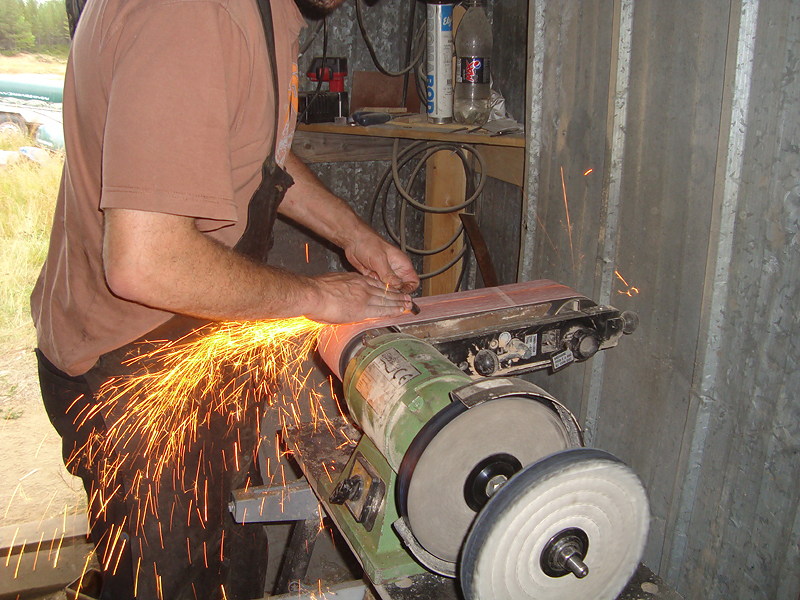 Nowadays handmade leukus and blades vary a lot from each other. Thickness can be from 3 up to 6mm. Grinds can be almost any types, from convex to scandi, with possibly secondary bevels. And as well as in history, some makers do really beautifully carved ones, and some make simple style users. 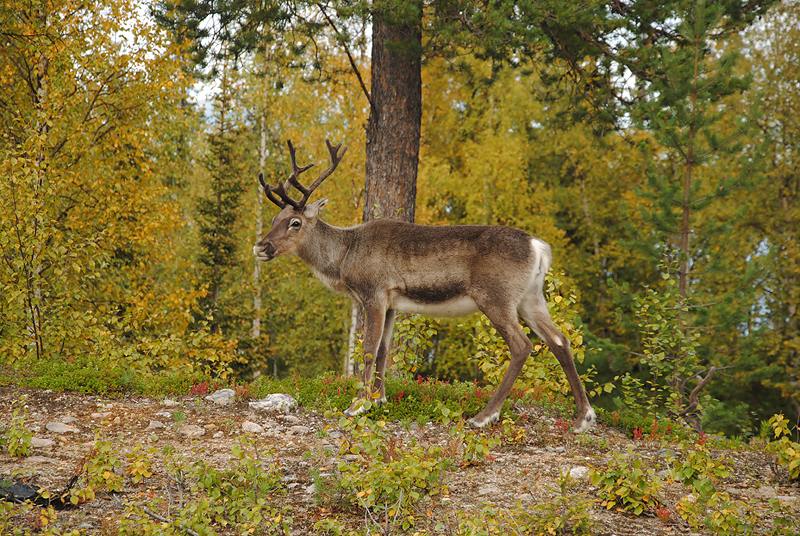 All materials can be used, from reindeer antler to kydex, a leuku is still a leuku. 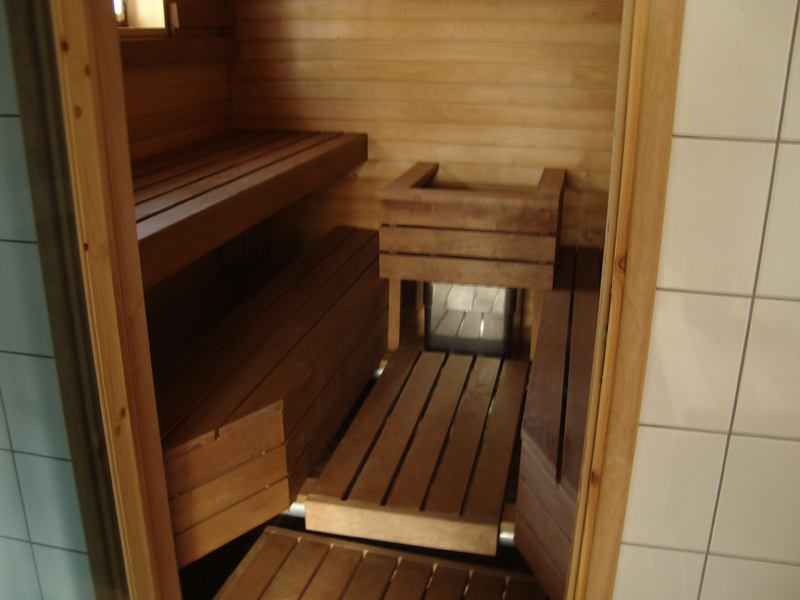 In northern Lapland, where I live, leukus can be seen in use still. 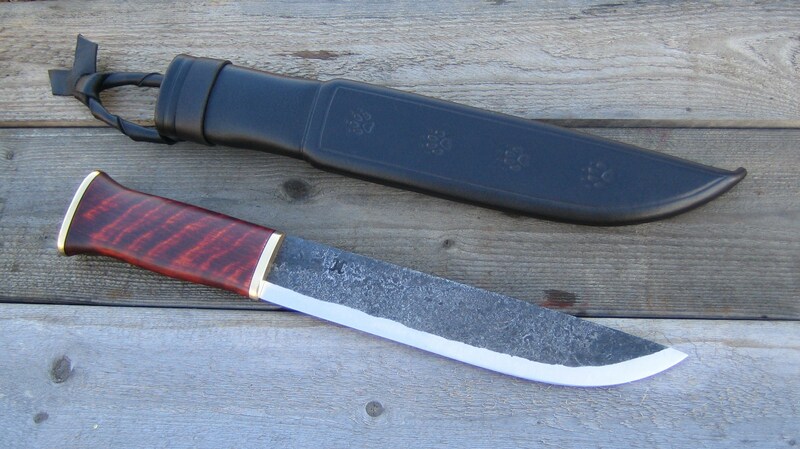 But most likely on the waist of a woodsman you’ll see a smaller puukko, with 10cm or shorter blade, accompanied with an axe in a backpack. But anyway it’s pretty common to see people carrying leukus still here, especially in winter time. I personally use leuku in several tasks. 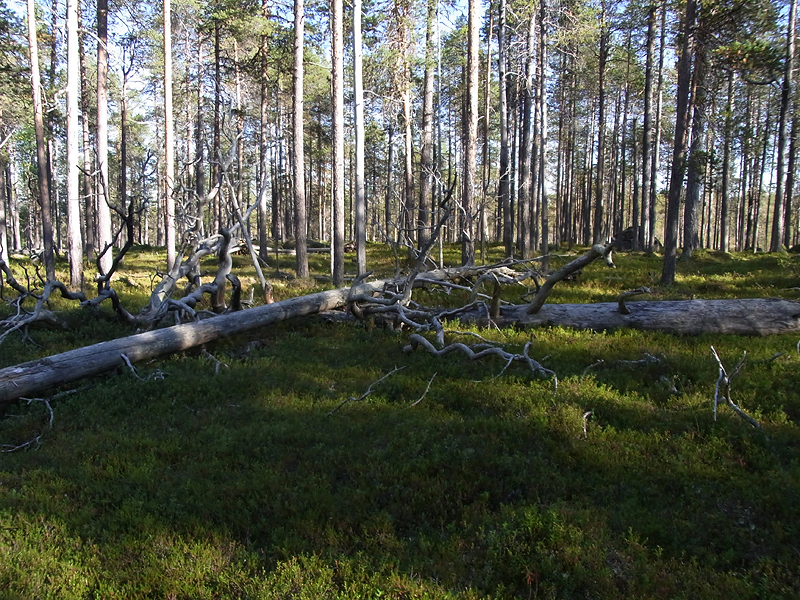 In willow grouse trapping in winter time, you need to cut lot’s of birch twigs when setting traps, and that’s where a leuku is really useful. In cleaning large fresh or dried hides a larger blade is useful too. Also in pruning and barking poles etc. 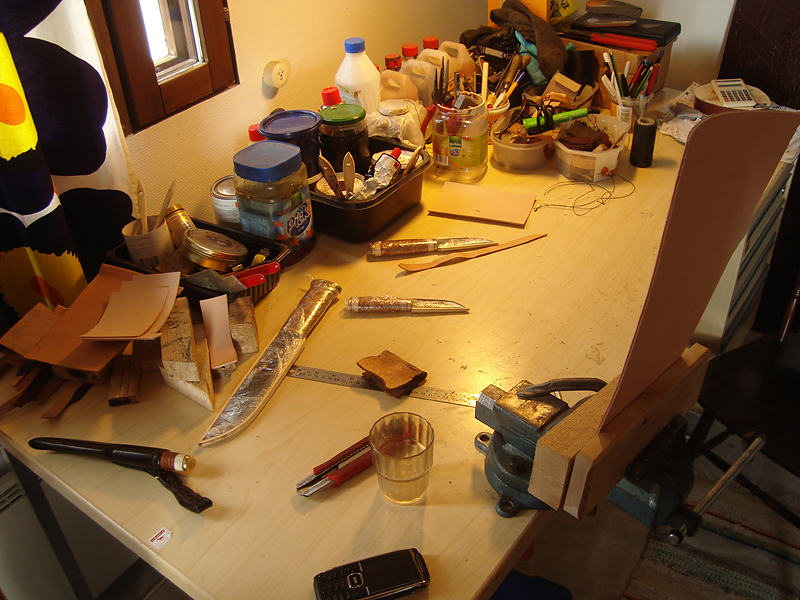 My ideal leuku is pretty basic user; curly birch handle with brass bolsters, about 5mm thick blade in 20-23cm lenght. 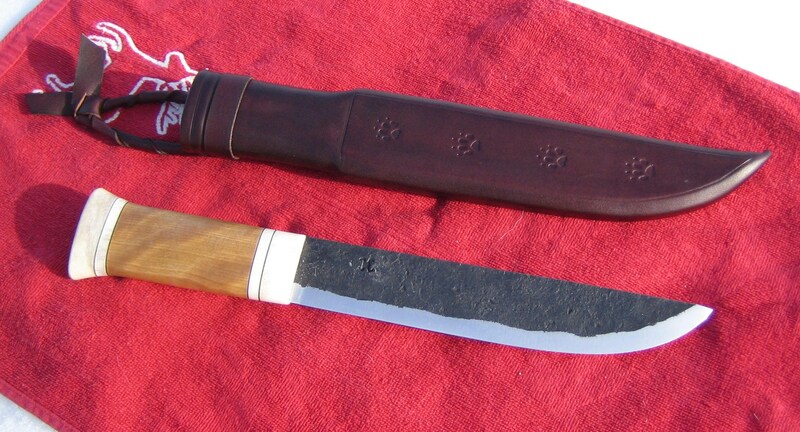 26-28 degree scandi grind with small secondary bevel, basic high leather sheath with traditional type choking belt hanger. 5mm thick blade gives bit more power, which is needed in batoning and splitting. Adding of course the weight a bit, but like in many things: to gain something is to lose something. All compromises. After all a leuku has something what every good item must have; a soul. 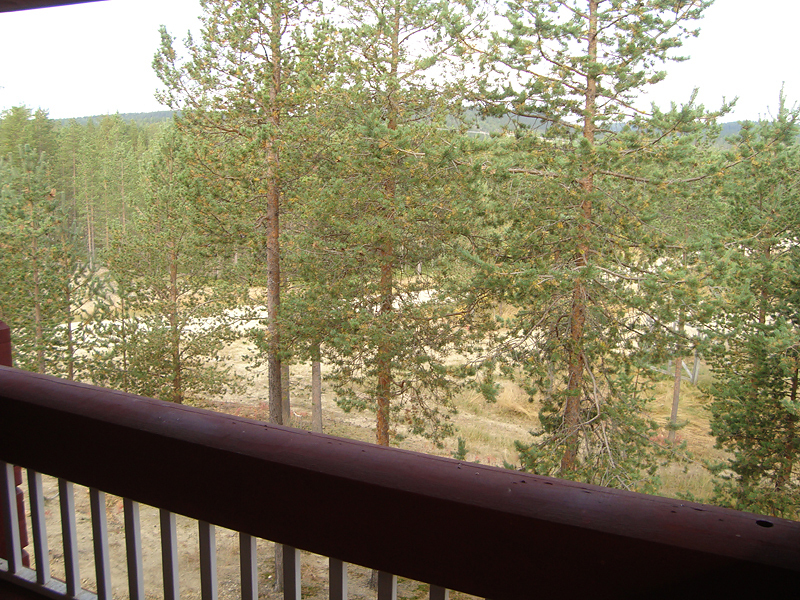 For me it gives an image of old times, wilderness, living in nature, Lappish scenery etc…. which all have a meaning for me too in one way or another. 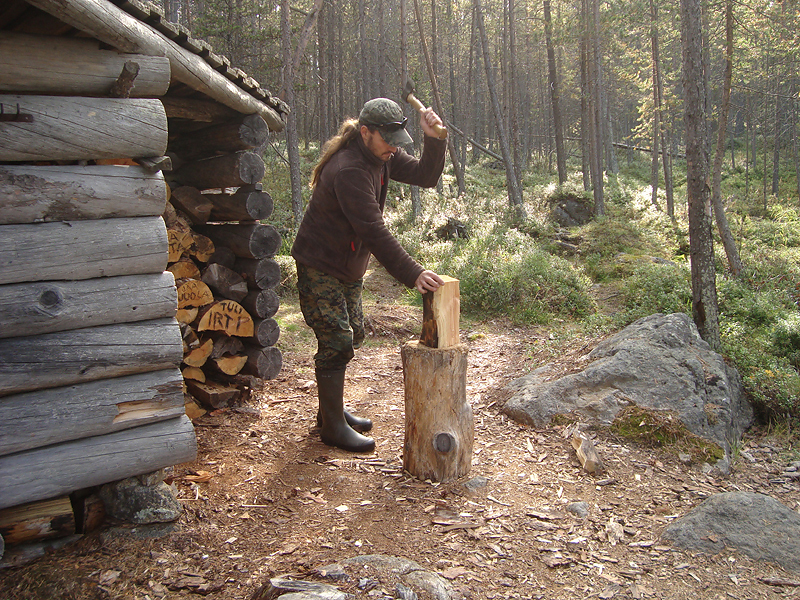 The first leuku was made for me by Pasi and shows his very high degree of skill and craftsmanship. This is a beautiful leuku that rises above just being a knife or a tool and definitely has the “soul” that Pasi speaks of. This blog post is about a road trip that Federico Buldrini made this past summer driving for something like 3660 km, that is 2270 miles. He left his home in Modena in Northern Italy and flew to Stockholm, then traveled on through Sweden and Norway before reaching his destination in the far north of Finland at the smithy of Pasi Hurttila, in Lappland north of the Arctic Circle. I enjoyed Federico’s account of the trip and the pictures he took so much that I asked him if he would post them here. He graciously agreed and what follows is his account of a visit to Finland. Thank you Federico! 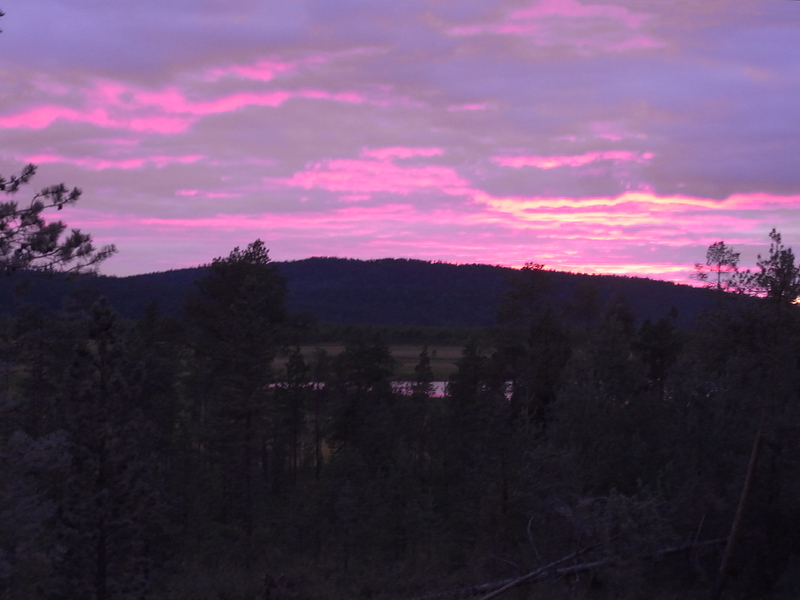 After a good night sleep we leave the hostel in Riksgränsen and drive east towards Karesuando, on a part of the E45 still to be completed, with dirt road without asphalt for around 20 kms. 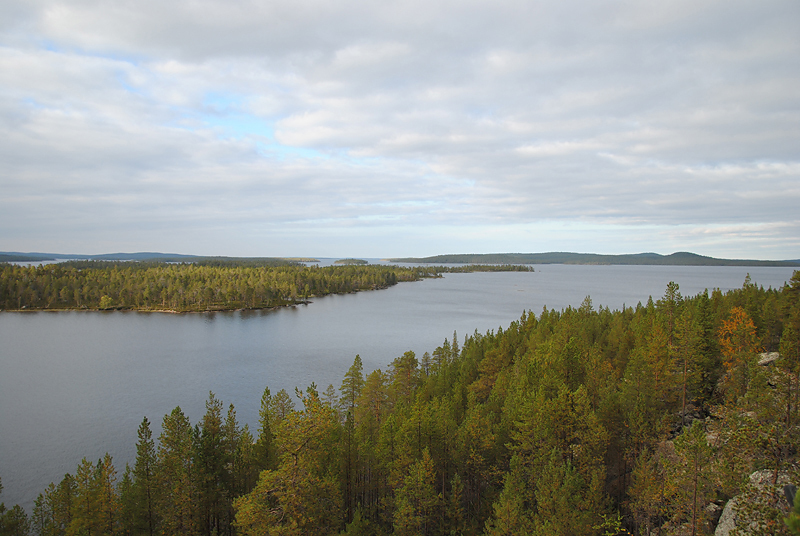 All the morning goes in driving, but after lunch we pass the border with Finland that cuts Karesuando right in two. Here we meet warmer and autumnal colours than in Sweden and Norway. 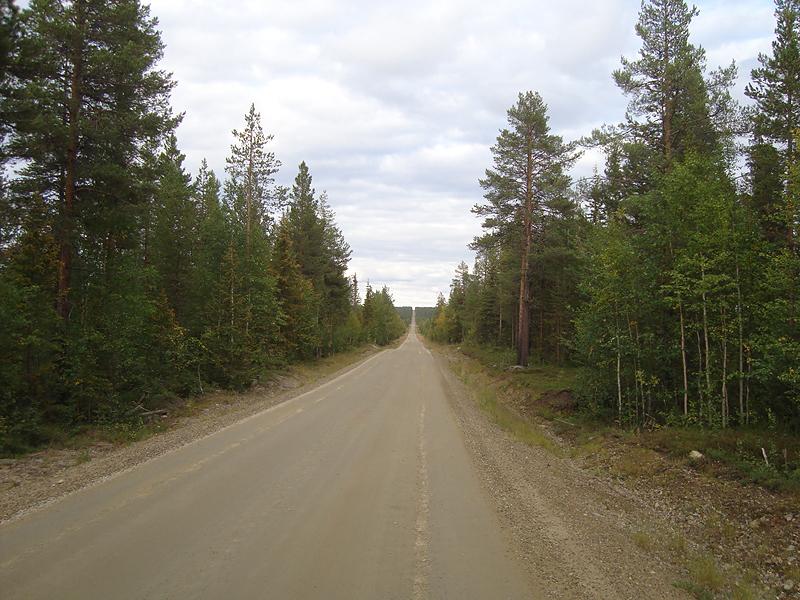 We go in the direction toward Inari on a dirt road, in the company of reindeer, birches and pines. 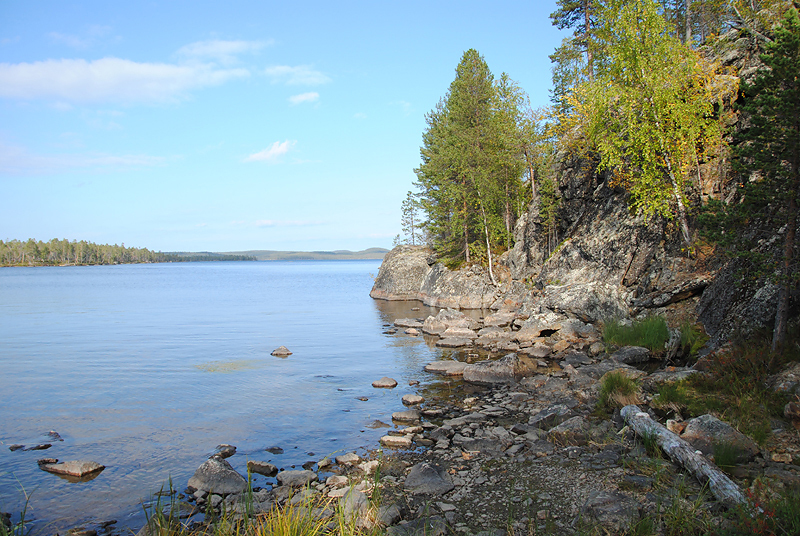 Inari, the lake. Green islands on deep blue water. Near a pier is moored a red and white float plane. 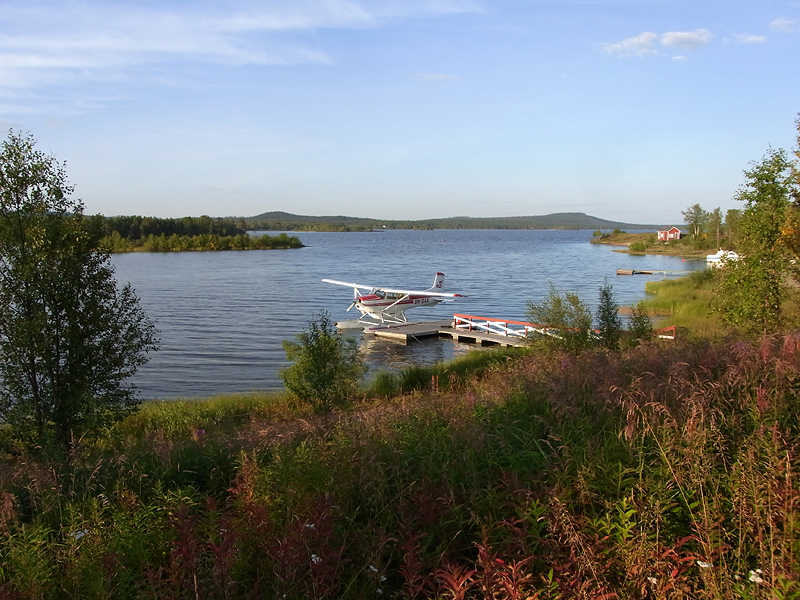 We take off for Ivalo, 30 km south from Inari. It’s already evening when we arrive at Pasi’s place. 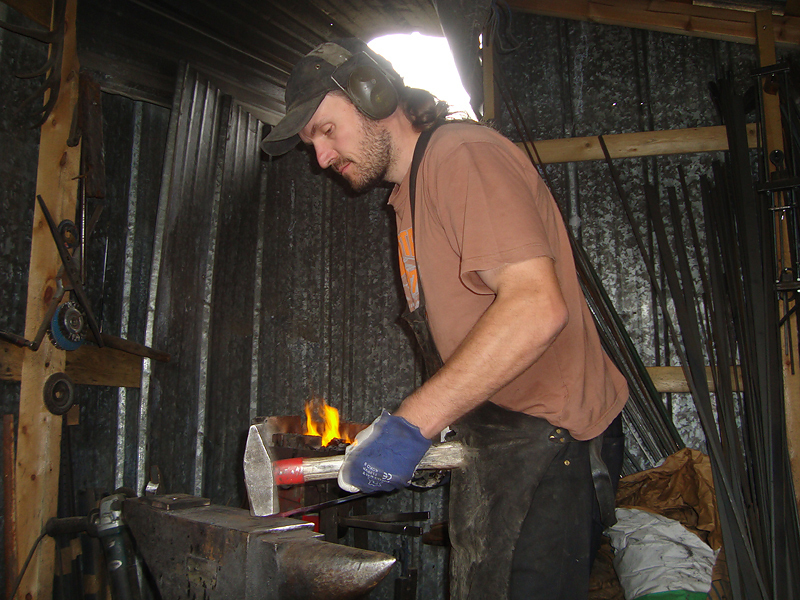 We take a look at his smithy. 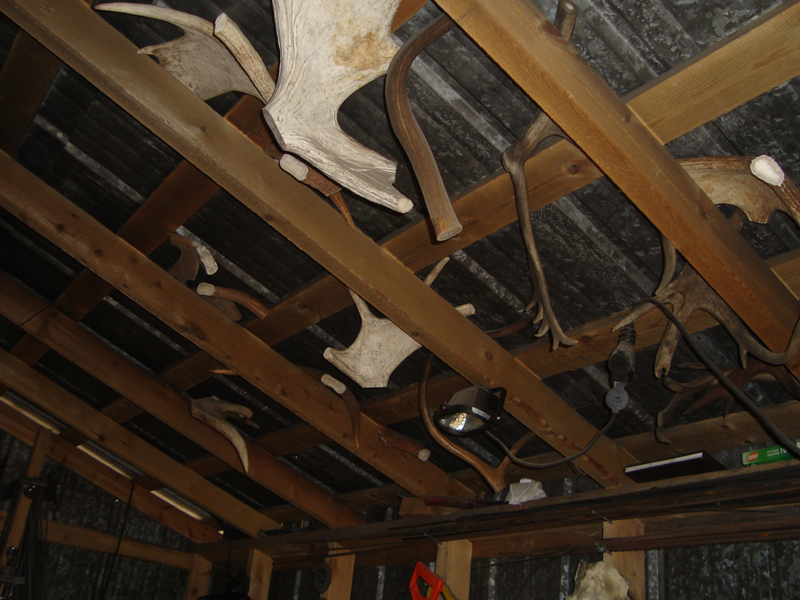 Belt sander and canvas wheel on the left, charcoal forge and anvil straight ahead, hammers, screwdrivers, files and drill to the right, antlers on the ceiling. 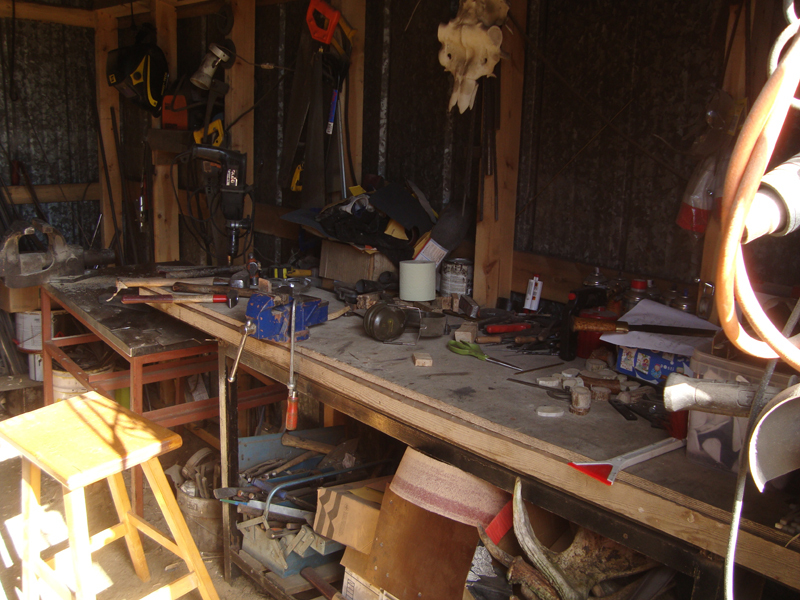 We enter his house and I see that his working table is inside, no workshop, just house and smithy. Everything else is in his hands and skills. 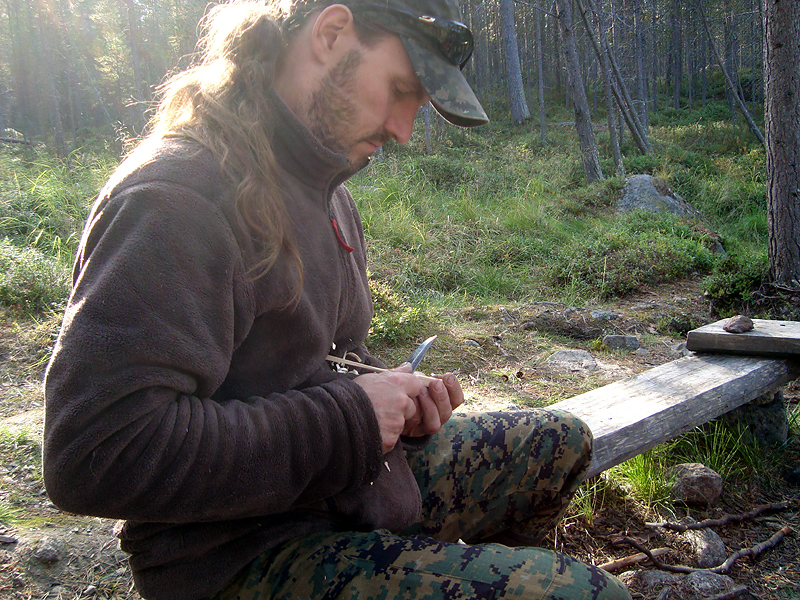 After breakfast I watch Pasi while he sews a puukko sheath. A few holes at a time with a awl mounted on a moose antler piece, two needles and double stitching. 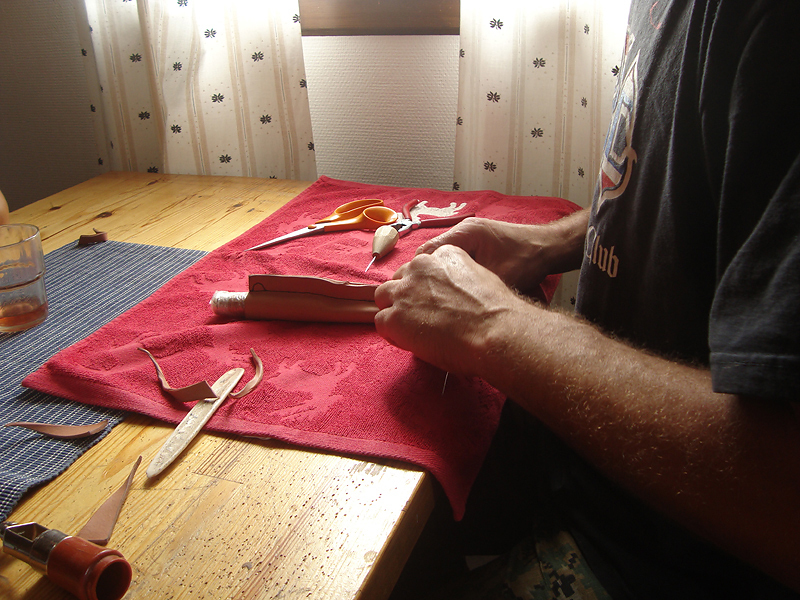 All the leather forming and decorations are made with a moose shin bone shaped on purpose for the job. 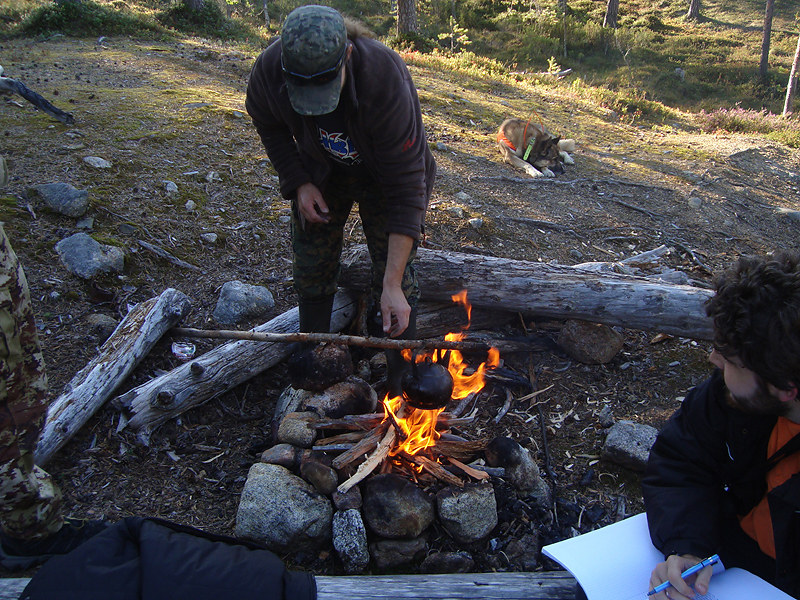 After lunch we go for a trip in the wilderness area dominated by the Sarmitunturi fell. 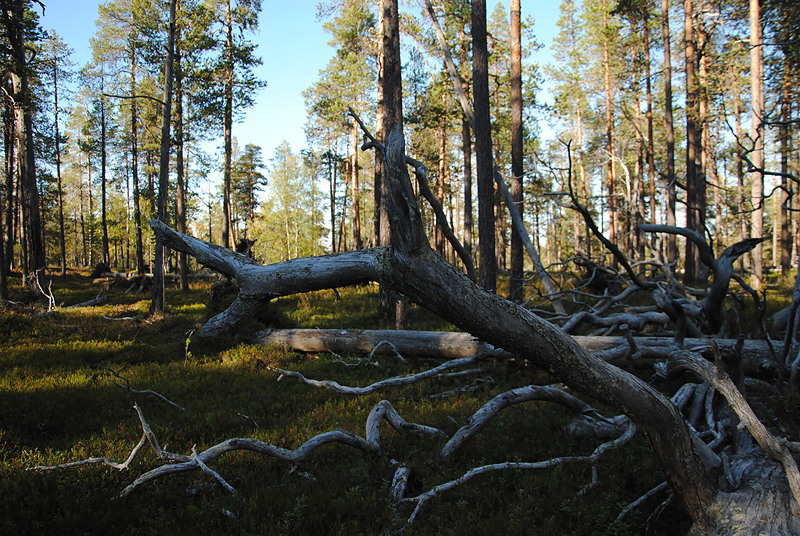 We’re about 10 km from Russian border, it’s a bear area and so Pasi takes his Sako 75, you never know. We walk on a carpet of moss, lichens and blueberries, pines around us. 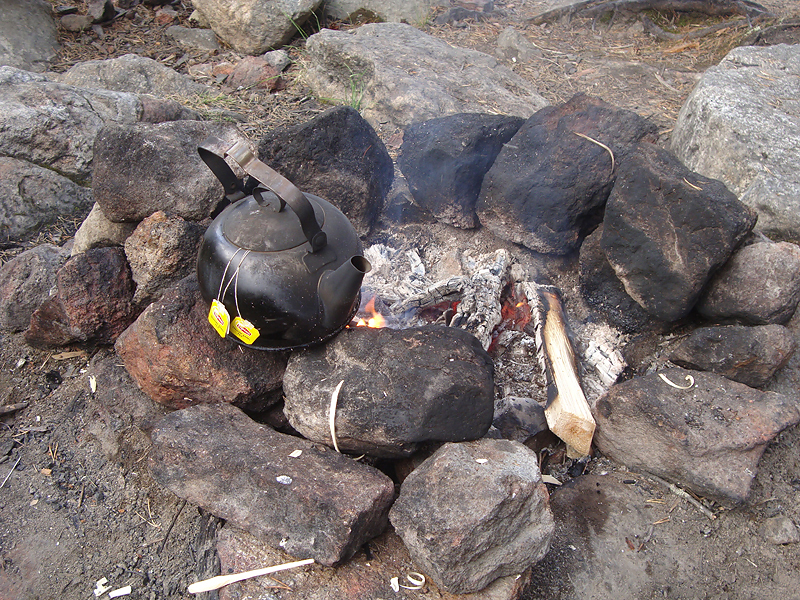 We’re near the top and we stop at a camp site for a tea. 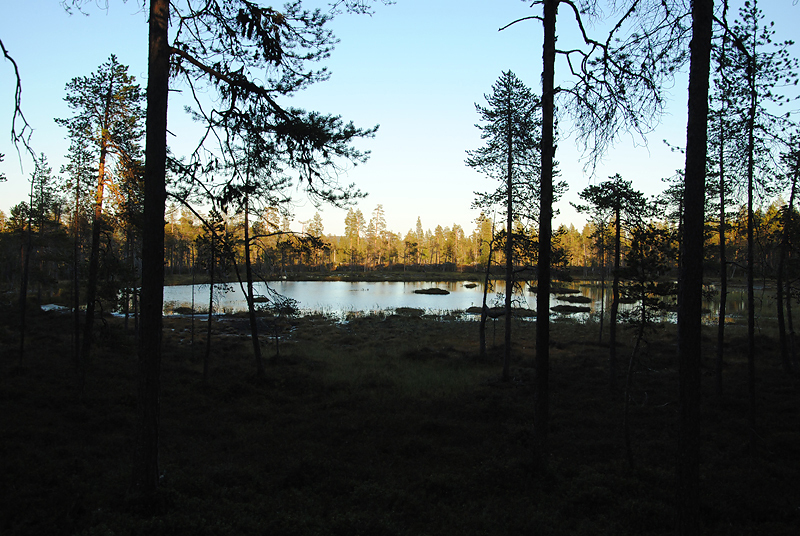 When we arrive on the top of the fell we have tundra all around us and few small lakes in front of us. On the top of the fell is a shabby Russian watch tower. 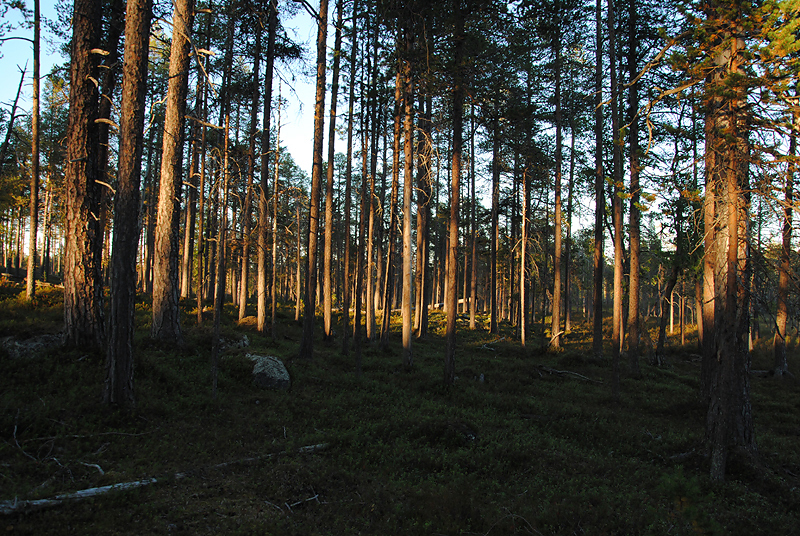 While we made our way back home the sun kept us company playing through the trees. In the morning we visit the Guesthouse Husky http://www.guesthousehusky.fi/ where Lea, Pasi’s girlfriend, works. In the winter the farm organizes sleds trip for tourists and Pasi sometimes works as a guide, as he did full time, when he was still a hobbyist blacksmith. The apartments were built a couple of years ago, but the farm has existed for 20 years. 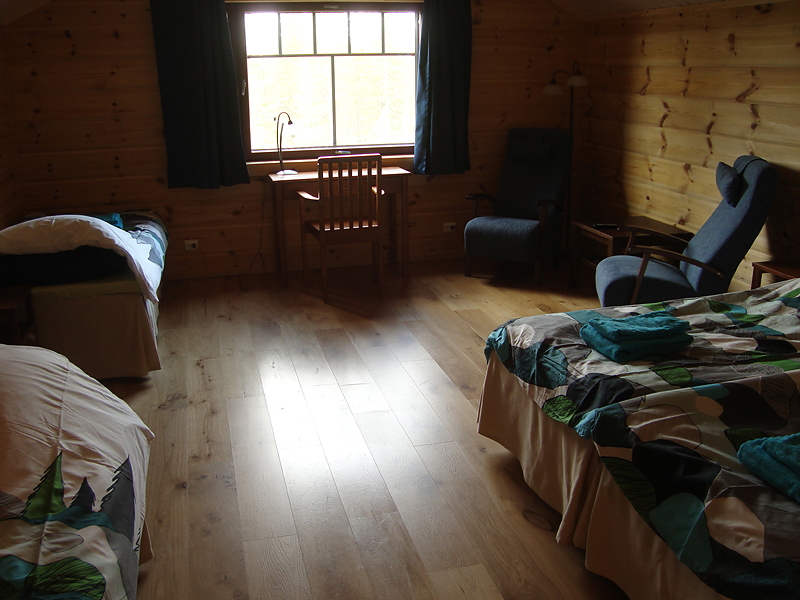 The farm is a junction between an hostel and camping, since it has rooms, but you’re right over the forest. You have all together a house room with moss and pine scent right outside, just a glass between. 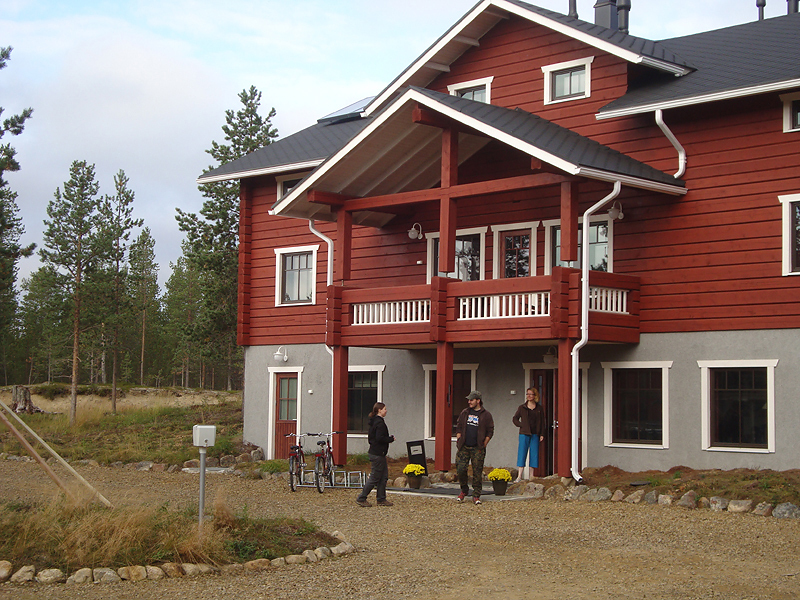 In the guesthouse there are few very nice rooms with bathroom, a common kitchen, a sauna, free wi-fi, bike and ski rental. All the interior is permeated by pine tar smell. The owners are really cheerful and helping people. 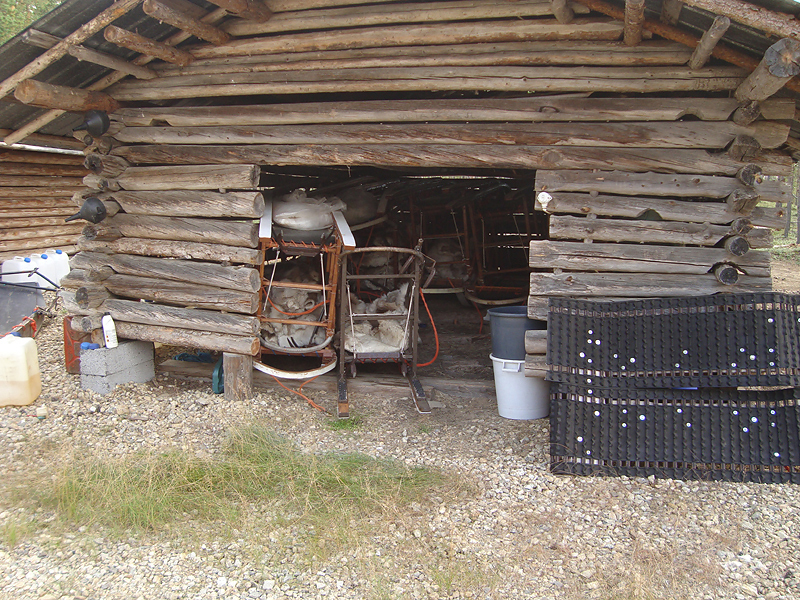 In front of the guesthouse there is the hut to store sledges. 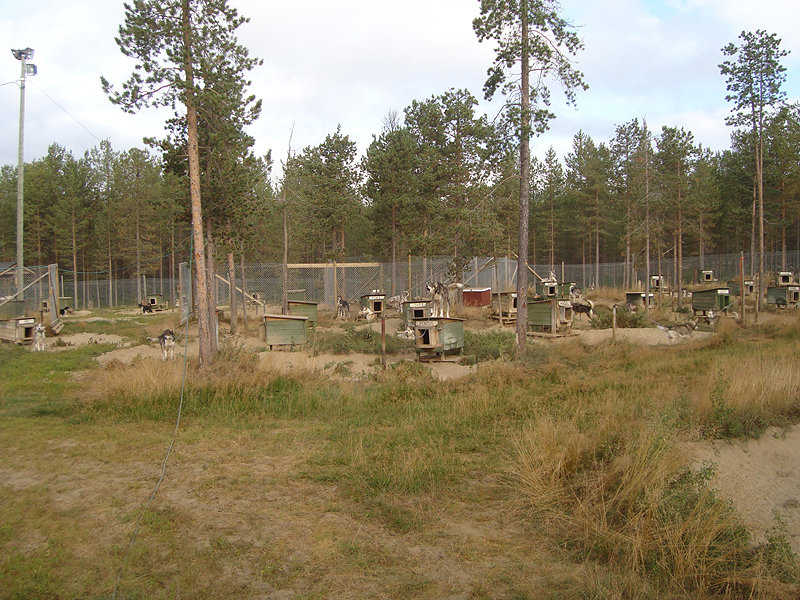 The dogs are kept in single clearings, with their own bed and place where they can move around. Rasmus is one of the usual pack leaders. Even if kept on the chain for obvious reasons I don’t see a dog with sad eyes, on the contrary all very spry. 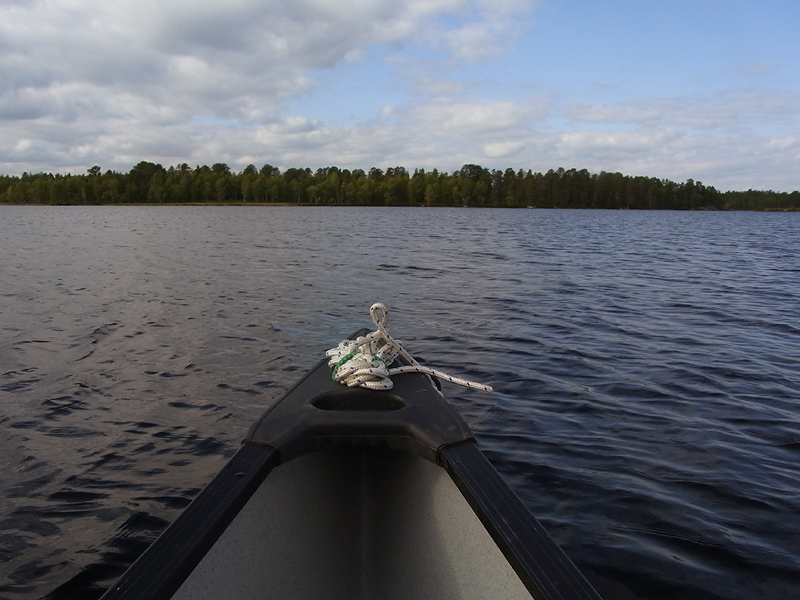 In the afternoon we take the canoes and go to lake Inari for a paddle. The plan is to arrive at one island with campsite and then go to the top of the island to take a look around. After about 2,5 hours we take land and set up camp. 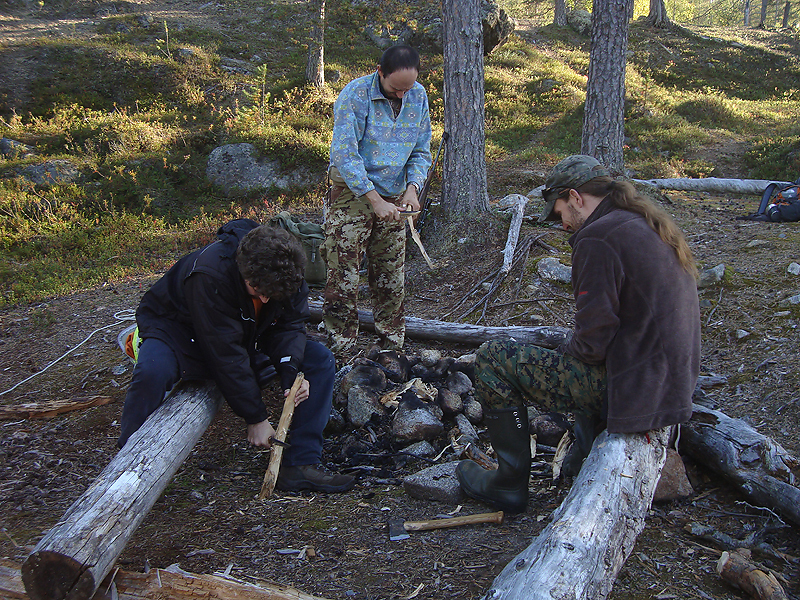 Pasi chops firewood, batons kindling and we carve spoons and spatulas while tea is warming up. A hot tea in excellent company, what else to desire? After the tea we climb up and take a look over the placid lake. 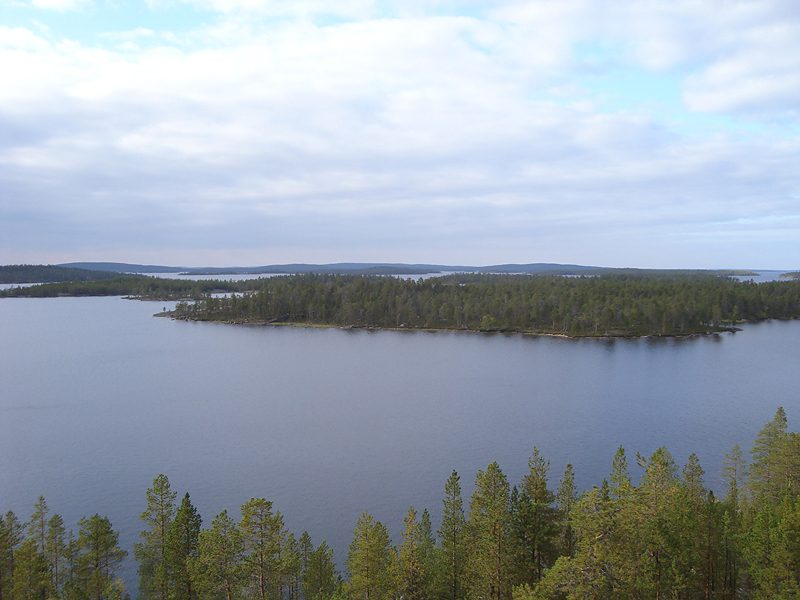 Lake Inari is actually frozen for almost 8 months a year and you can normally ski on it, rather than canoeing. On the way back the wind rises and pushes our breath down the throat. We put more effort on the row and slowly conquer the meters. The paddle bounds you to your work, even if you’re tired and want to rest, you keep on pushing the oar as you know that THAT is your duty. The canoe won’t proceed if only the helmsman conducts and to get out of the wind you have to do your part. I feel bit tired, the shoulders muscles start to ache but, as I tell Pasi, I wouldn’t want to be anywhere else. We finally get out of the wind and we can take a quick rest on a small island. The sun has started his set when we finally reach the pier, bit tired but happy. A good dinner, a night sleep and everything is fine again. Today I have the opportunity to see Pasi at work. 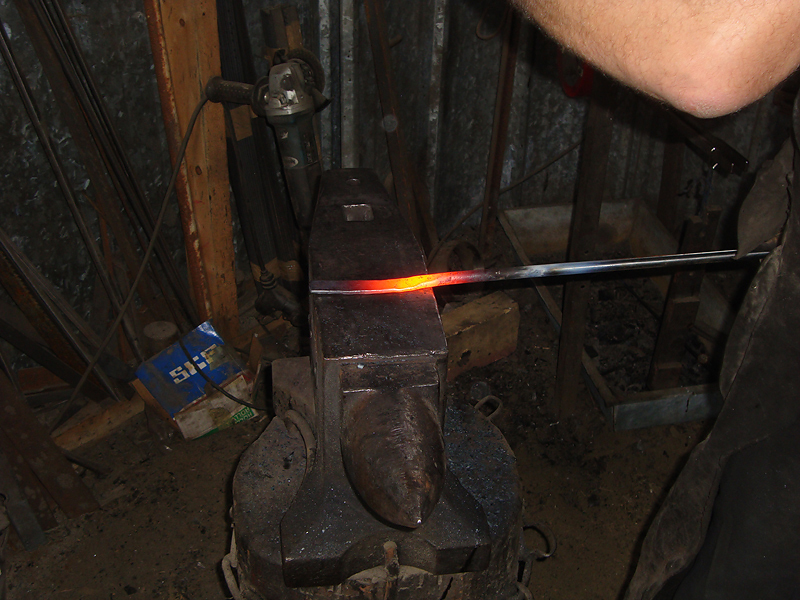 After having forged 40 nails, for an order of 200, he shows me the forging of a flat puukko blade. 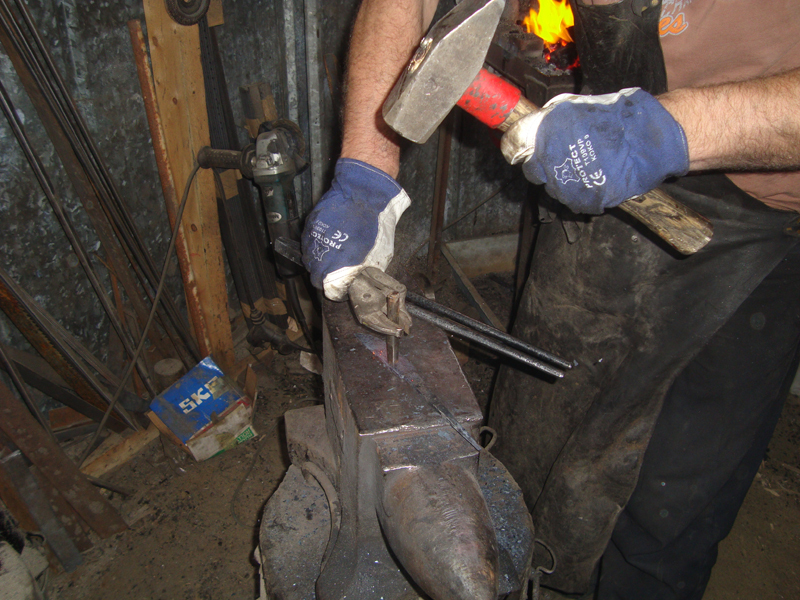 All the forging is done with a 1,5 kg hammer on a 85 kg anvil. 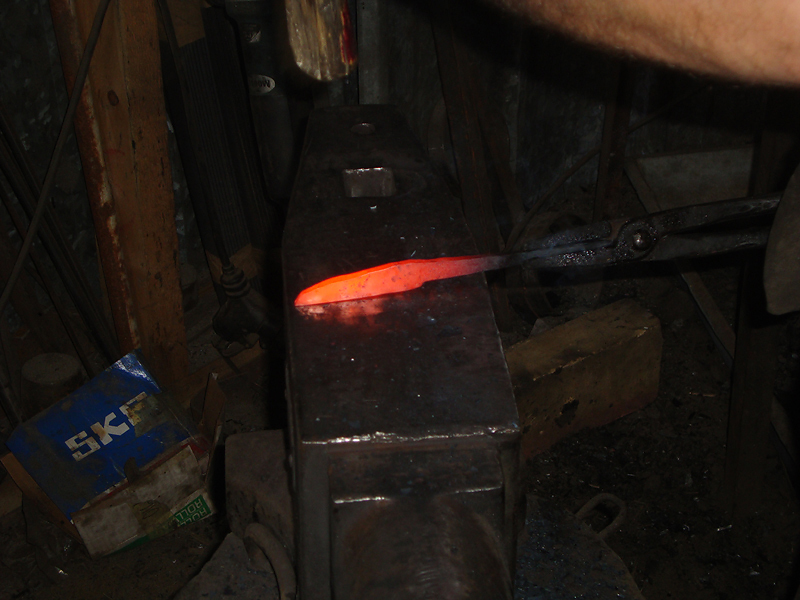 then kneels down to finish bevels forging and have a better sight of steel reaction. 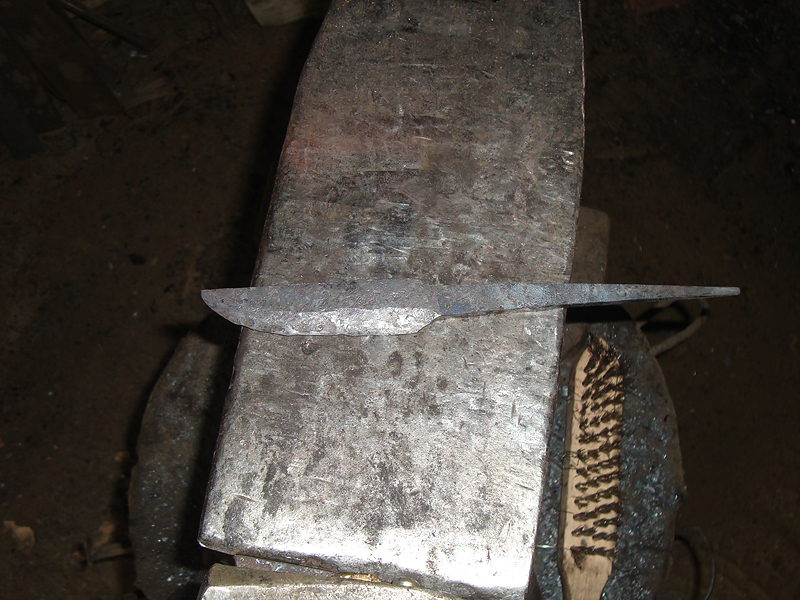 After 20 minutes, from heating the bar to stop, the blade is forged and ready for quick sanding before heat treatment. 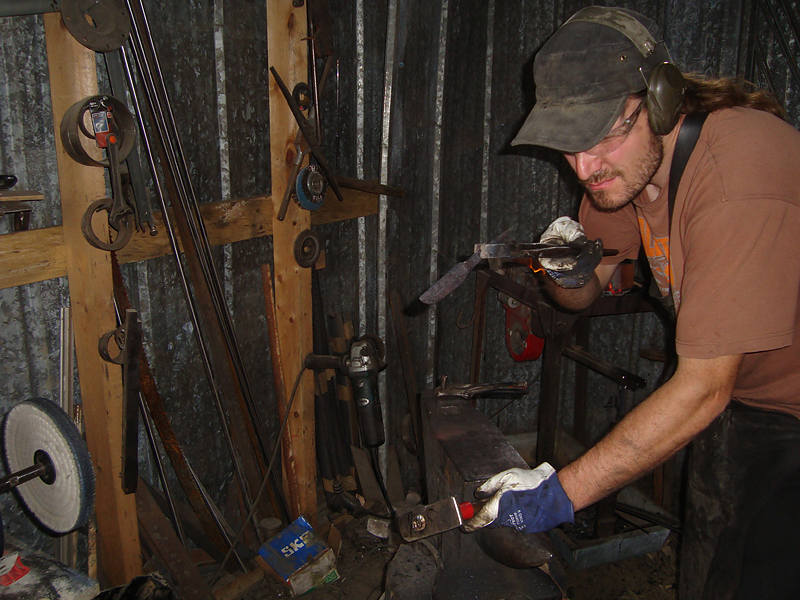 Pasi takes off the gloves, starts the belt sander at low speed and polishes a bit the bevels, marks bit more the shoulders and cleans the spine, cooling the blade in the water a few times during process. It doesn’t take more than 2-3 minutes, anyway. 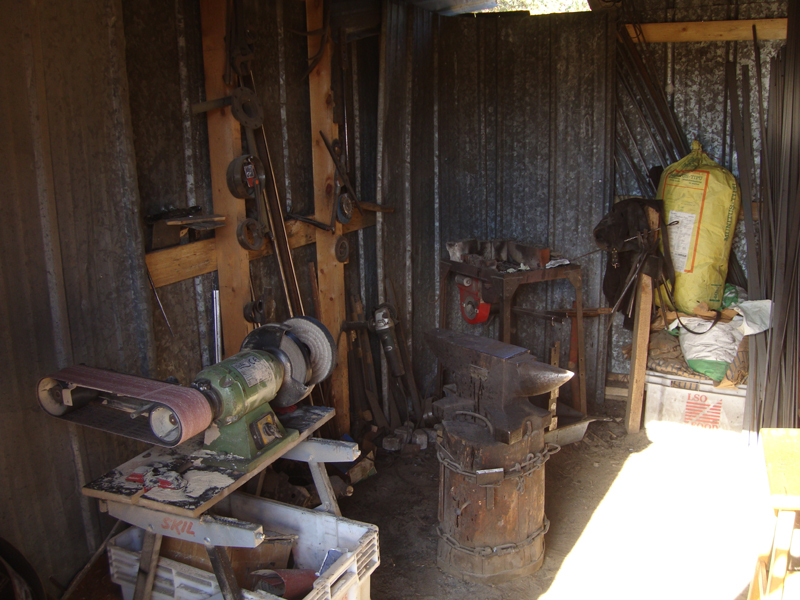 At this point Pasi tells me to close the door of the smithy to create more shadow, so steel colours can be seen better. 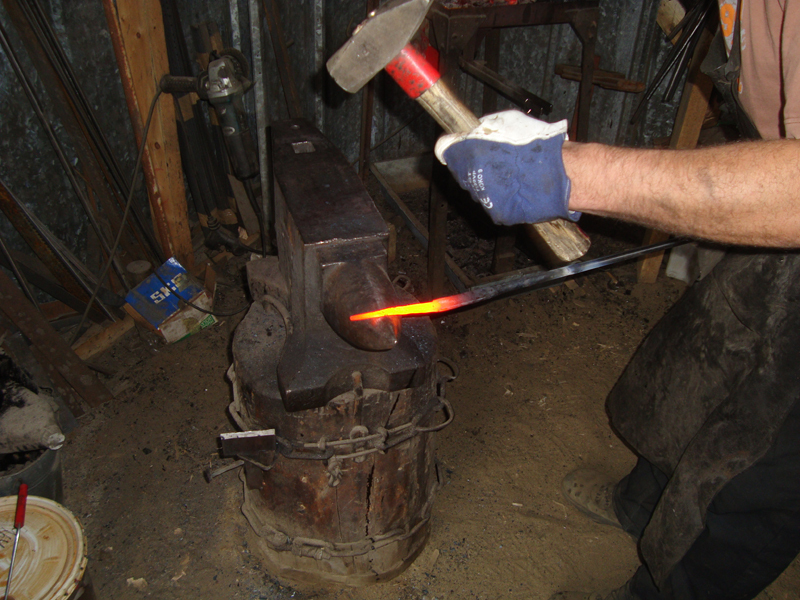 He put the blade into the forge again, took it out when it was cherry red and left it finally to cool at room temperature. Annealing is done. Then he extinguishes the forge fire and we go to drink something. 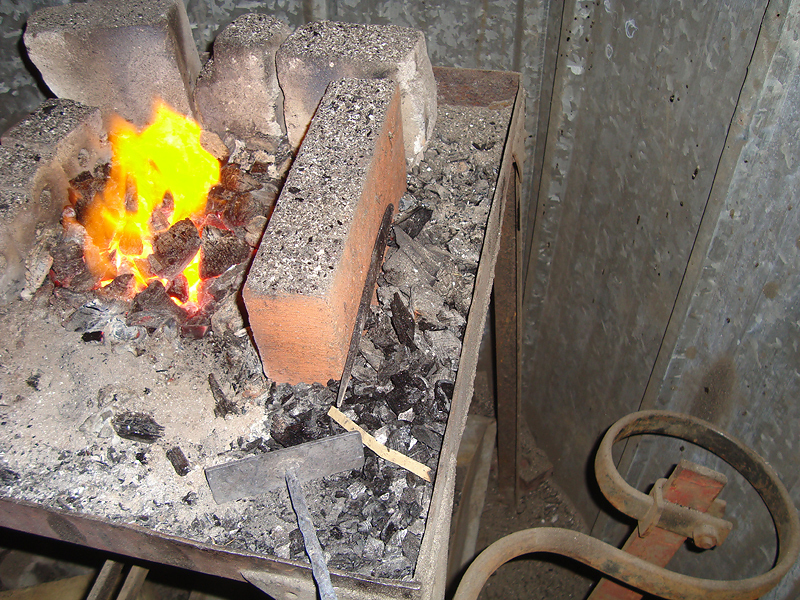 The rest of heat treatment will be done on the forge in the following days. 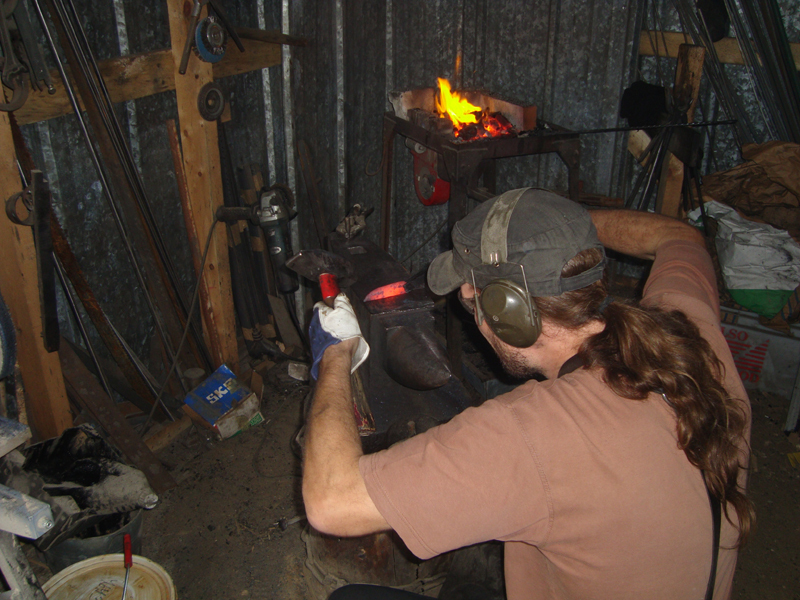 Pasi usually quenches in oil and gives two or three temperings to the blade. He doesn’t use ovens for treatments and doesn’t have will to. He doesn’t have interest to use ovens, rather to keep traditional ways. The evening is the last of our time together and we pass it talking and drinking. The next day we would have to start our way back to Italy. A leuku by Pasi Hurttila.